If the BR gets established at 1% level then would it also mean TeV scale new particles that LHC should find? Or would it be 10TeV scale new particles out of LHC's reach? Would New Physics (NP) contributions to this BR be generally order ~ (Weak scale/NP scale) or (Weak/NP)^2? Thanks! It scales as BR~(Weak/NP)^2, but with a large coefficient in front because the SM Higgs width is very suppressed. To explain BR~1% you need NP~multi TeV, so there is no strict guarantee of new particles at the LHC. However, most realistic models give additional suppression of BR by the small SM lepton masses, and then one needs NP~weak scale. 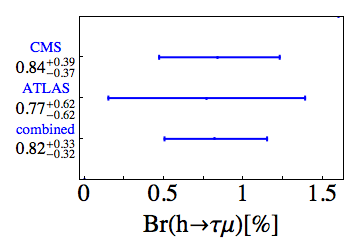 The Higgs-mu-e-coupling has strong indirect constraints from muon precision measurements (e. g. mu -> 3 e). How does new physics look like that gives H->mu tau without H->mu e? An interesting suggestion is 1504.01125, even though the model seems a bit contrived, but there are quite a few points on which it can be falsified. Please continue your blog, it is much appreciated. The central values of those measurements are amusingly close together, considering the size of the uncertainties. why would flavour non-conservation be such a big deal? Doesn't it happen constantly in neutrino propagation ? is it then not expected to find hints of the same in other leptons sooner or later ? Yes, I strongly endorse this pledge! How easy is it to distinguish H-->TT-->T-mu from H-->T-mu directly at the LHC? The tau mean lifetime isn't really all that long (2.9*10^-13 seconds) and a certain percentage of T in any set of 2 are going to take a second decay step reasonable quickly (certainly in less than the mean lifetime on average, an even faster for the soonest conversion infrequent enough to match the observed T-mu decay rate). Hi Jester, I saw something like this on Motl blog but I'd just feel a bit more comfy getting it from a cold headed pro than a SUSY enthusiast (it's just me no offence Josef). In any case would it take a lot to compile a list of still standing SM anomalies from LHC with their current status? Just curious, thanks! Anon, lepton flavor violation in neutrino oscillations is a tiny effect, which can be due to new physics at a very high scale, even as high as 10^15 GeV. That effect indeed does induce h > tau mu decays, but the branching fraction is so small that it can never be observed. On the other hand, observing lepton flavor violation in Higgs decays would point to new physics around 1 TeV or below. Andrew, h>tau tau is indeed one of the backgrounds, but not the worst one (e.g. Z > tau tau is larger). There are some angular variables that help to isolate the signal, but in general the separation is difficult. At the end of the day, they just look for an excess on top of known backgrounds around the tau-mu invariant mass of 125 GeV. RBS, I think Lubos' list is more or less complete. However, one should remember that the number of deviations in ATLAS and CMS data what one expects just from background fluctuations, given the number of searches performed. So any single anomaly in this list is most likely just a fluctuation of the SM background (including the ones I wrote about in this blog). "h>tau tau is indeed one of the backgrounds, but not the worst one"